Very comfortable and forgiving, early planing great upwind performance, incredible control and stability. Wood Core The wood forms the heart of your board and gives it most of its mechanical properties: strength, flex and resilience (ability to return to its original shape). Each year, in order to master these properties, we seek to optimize its distribution, particularly in terms of thickness. ABS Inverted Rail We sought to gain support and a more progressive and constant contact in the water. Starting with a surfing rail type, we have only kept the bottom part and the result is a reversed rail profile. Its entry into the water is more gradual and the board feedback is softer. Direct Drive The Direct Drive technology is present on our boards since 2001, and refers to a board with minimal thickness, a 100% wood core and a 100% fiberglass envelope. 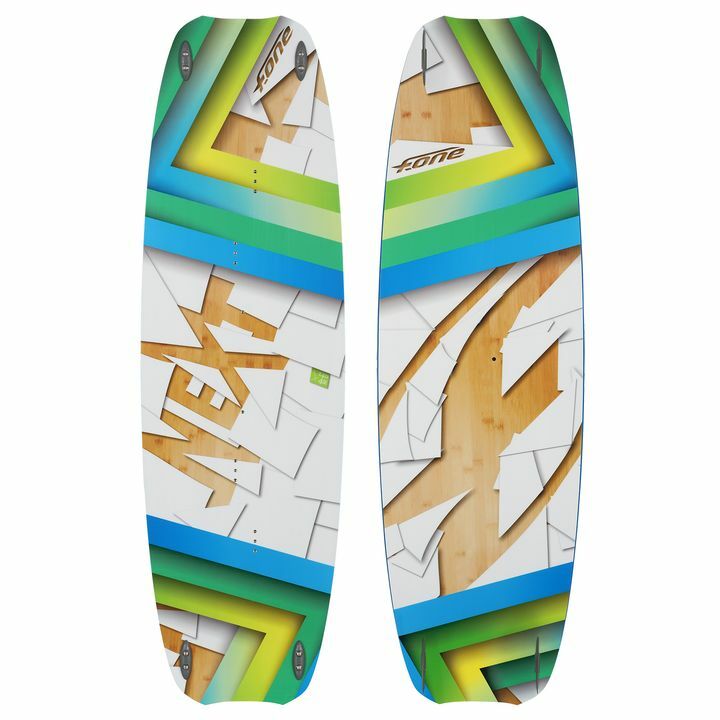 These interlocking elements meet the F-ONE standards for a kite board and provide maximum durability. The Direct Drive translate into a precise board, quick and active as it erases the flaws of the water surface, collecting its energy and giving it back for the best performance. The feeling of riding a rock solid board always in contact with the water without suffering from it is even greater. TECHNOLOGY The fin base goes through the board and is secured on top by a thin box. The main innovation of this system is that the box does not need to be integrated into the board; rather the board is sandwiched between the fin RESPONSE and its box. As a result, our 3mm board thickness and its flex are left untouched. With the UNIBOX system and its asymmetric profile, you gain in gliding efficiency and can start planning earlier. It improves the ride comfort as well thanks to the fins flex. MOUNTING The fins RESPONSE are color coded on their base (red and green) to facilitate their assembly and respect the asymmetrical aspect. The matching color is also present inside the fin holes on the board. As a result, mounting the fins is really easy: red on red, green on green. The box part on top of the board can be mounted in either direction. Since 2013, a notch has been added on the box so you can mount a leash board if you need to. Probably the most comfortable combo Strap / Pad on the market. The pads are in general difficult to design because they must fit all types of feet. They must ensure the best connection with your board to have the best feel possible while riding, and absorb the impacts. 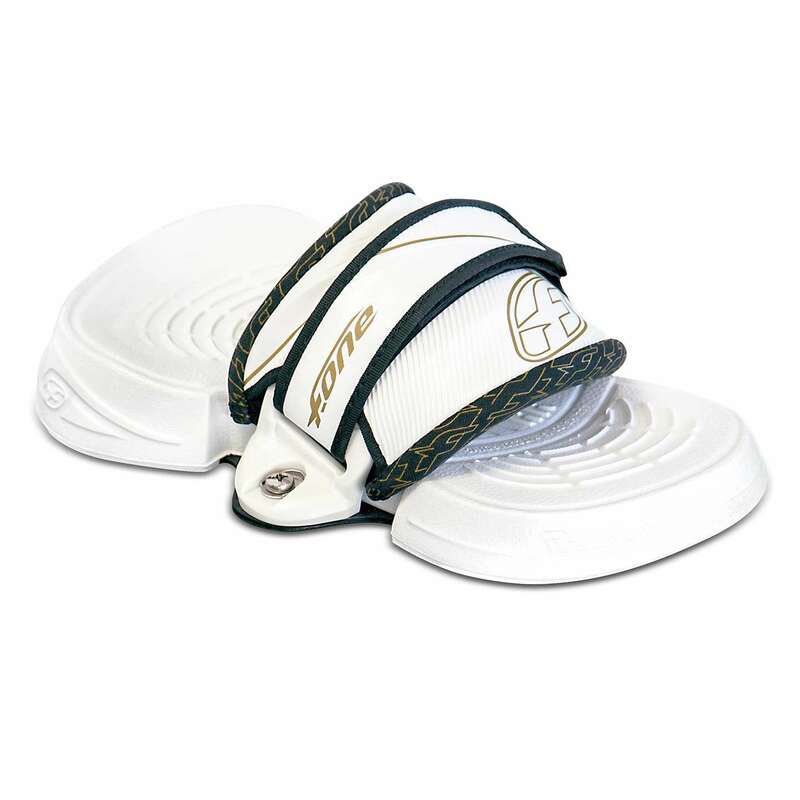 With the straps, the pads must lock your feet in the ideal position. To obtain the highest quality pads, we have chosen an injected process that permits various forms and densities. A unique process that allow to generate all possible forms while picking the best EVA foam density. Because a pad, it’s those two essential things: a form and a foam. The F-ONE strap is fully adjustable to the size and shape of the foot and brings great comfort with a multilayer of different EVA density and its Neoprene coating. The Straps Lock F-ONE facilitate the general installation because they are locked in independently from the strap. The straps lock are designed to give the strap the ideal angle and shape.